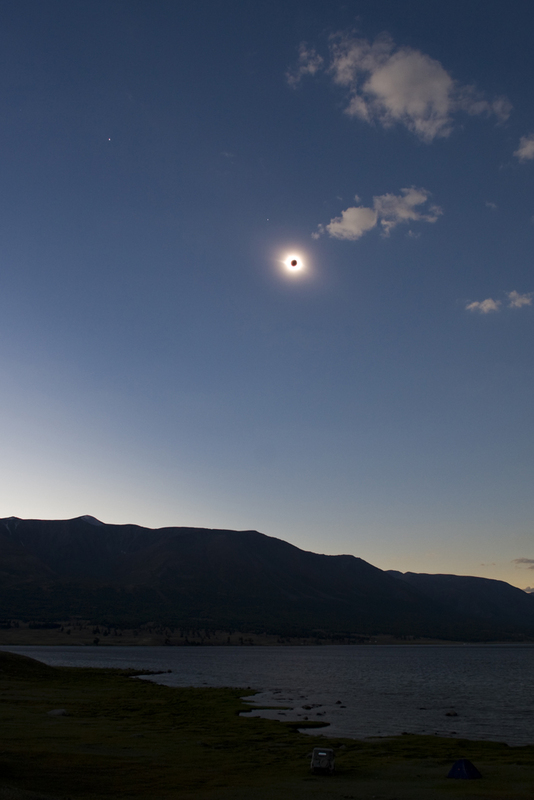 After months of planning and hoping for success getting from point A to B to C to D (the final location being our eclipse camp), not to mention all the wishing for good weather and clear skies, the TSE (total solar eclipse) of 2008 has come and gone, and WE GOT TO SEE IT! Only 2 minutes and 5 seconds, it was lightening fast (time never seemed to pass so instantaneously in my life)… but during totality, when the moon blotted out the sun in the sky, the sight of the glowing ring around the black orb was mesmerizing… and the sight, like a picture in a photo album, is etched into my memory even though afterwards, it felt as if the whole experience was a dream. Perhaps the sight is so surreal that the brain cannot interpret the event in any other way but as an odd concoction of sleep’s imagery. As everyone who has witnessed a TSE has said, it was truly a spectacular sight. I can’t say it was a life changing experience – apart from the fact that any travel to foreign lands is a life changing experience – but it did add another hobby to my ever-growing roster. I’m addicted to eclipses and can now call myself an ‘eclipse chaser’, with plans as soon as I get home to make arrangements for next year’s TSE, which will be over 6 minutes in the seas south of Japan! They say you shouldn’t bother trying to photograph the eclipse, especially for ‘eclipse virgins’ like me; it’s hard to capture unless you’re a real pro with a lot of experience (not to mention it’s a waste of time to be fiddling with your camera instead of looking at the sky). I took this image during totality, which comes nowhere close to doing the sight justice. The sun/moon looks much smaller in this photo than it did in “real life”, and the camera recorded a lot of the sun’s flare, which isn’t visible during the actual event – it sort of ruins the effect of a glowing eye, the ‘eye of God’ as some call it. There are 2 white specks captured, just left of the sun (and slightly higher) – 2 of the 4 planets visible during the eclipse. I believe the closest to the sun in Mercury and the other is Jupiter. I have much more to say about travel in Mongolia, and the eclipse experience itself, but I would be held up in this internet cafe for a solid week if not longer, just getting it out of my head and journal. Stay tuned for more blog updates, but for the real story, I need more time (and a willing publisher). § 3 Responses to Total solar success"
That’s a beautiful shot. Congratulations. You are currently reading Total solar success at On the Road.